Summary The utility company Sydkraft (now EON) has developed an energy system based on 100 % of renewable energy sources for the building fair Bo01 in Malmö 2001. One part of this system is this 8 kW PV installation. 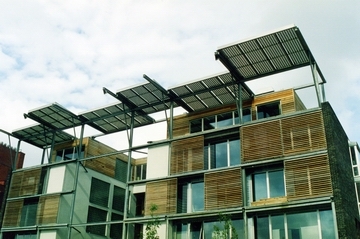 The PV system consists of one part with semitransparent modules that are integrated in a horizontal moveable sunscreen and one smaller part with standard modules mounted on the roof of the building, some with 60 degrees tilt and some with 30 degrees tilt.